Animals and the Lunar New Year! 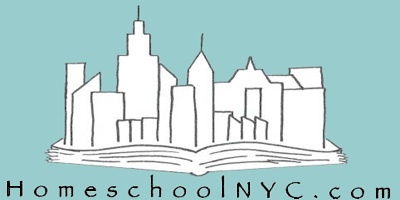 Welcome to the HomeschoolNYC Newsletter! Winter is almost over, and the HomeschoolNYC newsletter is back with articles and ideas on homeschooling, teaching and child-led learning. Lately parents have been asking me about math. For younger kids, try animal math! 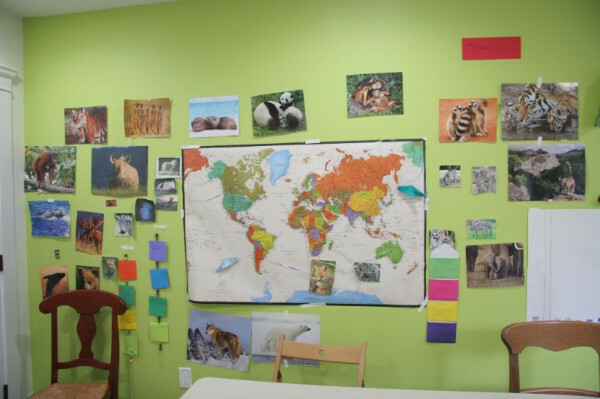 Kids can find out the weight, height, speed, quantity of daily food, life span, migration distance, all about a favorite animal. Go beyond math and science to include language arts and social studies: read animal folktales, create animal puppet shows and write animal poetry. Celebrate the lunar New Year with the animal zodiac. Learn how animals get ready for spring! Animals! Animals! Children adore this theme, which touches on every academic subject. Animal photos are linked to locations of origin on a world map (geography), where origami fish swim (art). Animal facts are displayed on cards and envelopes (language arts). At far right (behind chair) a graph depicts animal heights including the heights of human students (math and science). 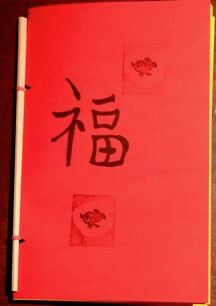 This simple stick-and-elastic book was made with red paper, a wooden chopstick and a red rubber band. Words in Chinese for Happy New Year and GOOD LUCK can be found on-line. The Business Insider lists five reasons in their tech column why Homeschooling is the Smartest Way to Teach Kids in the 21st Century. Their first two reasons are the same: personalized learning, and learning what you really care about. Other reasons include getting out of a negative school environment, and learning in the "real world." I disagree only with reason number #3, obviously chosen by a tech person, which states that students develop meaningful relationships through social media. Here in NYC, homeschoolers develop meaningful and lasting friendships in person, participating in various groups, in different locations, in varying activities. The socialization issue is one of many myths about homeschooling. "The motivation to learn is an innate condition of the human race. The least we can do is nothing to inhibit it." What's Free or Cheap in NYC? Over 1200 links to educational activities K-adult! Copyright © *Feb. 23, 2018, HomeschoolNYC. All rights reserved. Comments and feedback welcome! E-mail: Laurie@HomeschoolNYC.com.